Iran's Supreme Leader Ali Khamenei has set out several conditions for staying in the nuclear deal with world powers. The conditions include protecting Iran oil sales and safeguarding trade. US President Donald Trump has said he is withdrawing from the deal, and on Monday Secretary of State Mike Pompeo said sanctions lifted after the 2015 deal would be re-imposed. Under the deal, Iran agreed to curb its nuclear activity in return for the lifting of sanctions. Since campaigning to be president, Mr Trump has been heavily critical of the deal, and earlier this month he threatened economic sanctions on companies which did business with both Washington and Tehran. The UK, France and Germany, meanwhile, have been trying to keep the deal alive, and Iran says it will restart its nuclear programme unless its concerns are met. What are Ayatollah Khamenei's main conditions? He also said Iran could no longer have any dealings with the US. "The Islamic Republic cannot deal with a government that easily violates an international treaty, withdraws its signature and in a theatrical show brags about its withdrawal on television," he said. What was he responding to? 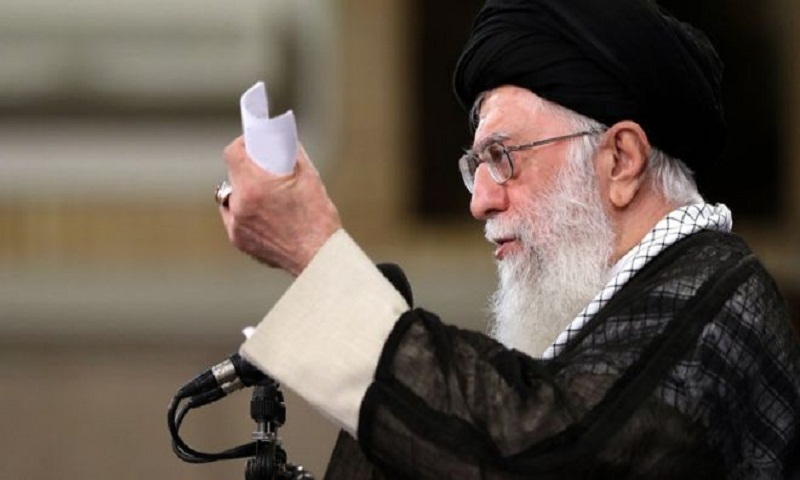 Ayatollah Khamenei's remarks came two days after Mr Pompeo set out his own conditions for any new deal with Iran. These included the withdrawal of its forces from Syria and an end to its support for rebels in Yemen. US sanctions lifted after the 2015 deal would be re-imposed, the US secretary of state said, and those and new measures would together constitute "unprecedented financial pressure on the Iranian regime". The older US sanctions prohibited almost all trade with Iran. Mr Pompeo did not say what new measures Washington was contemplating but described sanctions imposed last week on the head of Iran's central bank as "just the beginning". Iran is one of the world's largest oil producers, and the export of oil and gas is worth billions of dollars each year. Both the country's oil output and its GDP fell noticeably under international sanctions. The sanctions will not be re-imposed on Tehran immediately but are subject to three-month and six-month wind-down periods. Is the US on its own? Israel praised the Trump administration's decision to pull out of the pact but the move was roundly criticised by fellow signatories, including France, Germany, the UK and Russia. All of the above signatories pledged to honour their commitments under the deal. Mr Pompeo has made clear he expects the backing of his allies in Europe but also called for support from "Australia, Bahrain, Egypt, India, Japan, Jordan, Kuwait, Oman, Qatar, Saudi Arabia, South Korea [and] the UAE". What was agreed under the 2015 deal? The Joint Comprehensive Plan of Action (JCPOA) saw Iran agree to limit the size of its stockpile of enriched uranium - which is used to make reactor fuel but also nuclear weapons - for 15 years and the number of centrifuges installed to enrich uranium for 10 years. Iran also agreed to modify a heavy water facility so it could not produce plutonium suitable for a bomb. The deal was agreed between Iran and the five permanent members of the UN Security Council - the US, UK, France, China and Russia - plus Germany. Iran insists its nuclear programme is entirely peaceful, and its compliance with the deal has been verified by the IAEA.